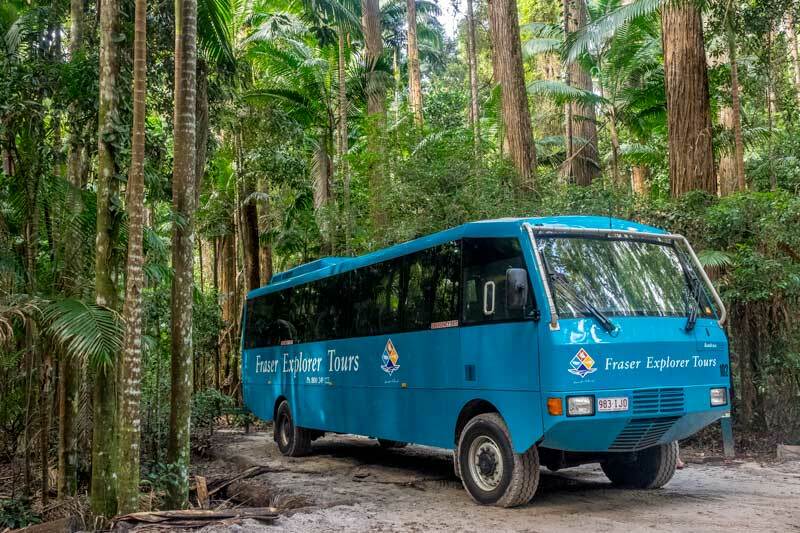 It had been over 10 years since we were last on Fraser Island so when Fraser Explorer Tours invited us over to experience their 2-day adventure tour we didn’t hesitate. We were curious to see how much the worlds largest sand island had changed in a decade, what impact tourism had had and just how much of the natural heritage site could be explored in 2 days. If you’re thinking of including Fraser Island on your Australian itinerary we have plenty of tips to share. Why we choose the 2-day Fraser Explorer Tour? 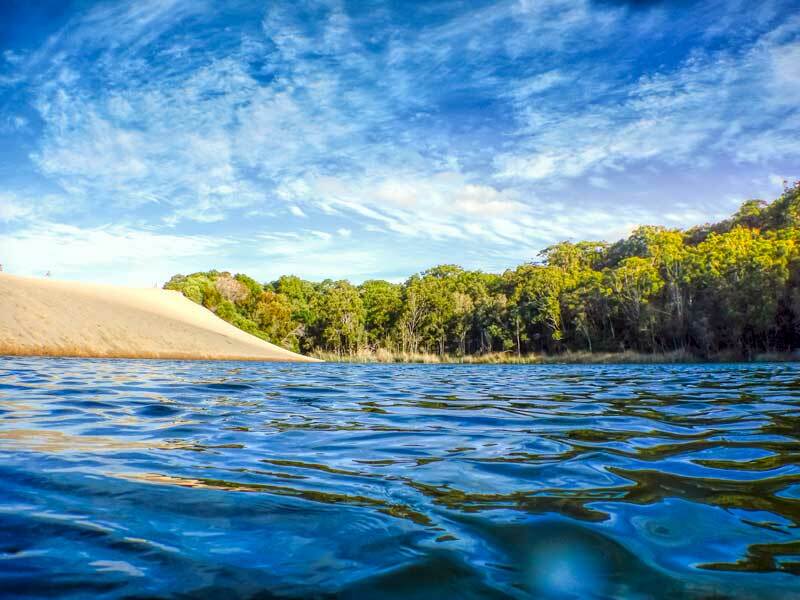 Fraser Island is the worlds largest sand island and appears on the UNESCO World Heritage list as a place of natural scenic beauty, the entire island plus a couple of smaller islands offshore are recognised for their significant ecological, geological and hydrological value. Sand islands form over hundreds of thousands of years as the wind and currents carry sand from distant places and deposit them. In the case of Fraser Island that sand comes mostly from northern and central New South Wales and as far away as South Australia. Southeast Queensland is home to the 4 largest sand islands in the world, after Fraser Island comes Stradbroke Island, Morton Island and Bribie Island. We’ve visited all 4 and have linked articles that provide some further information if you plan to visit the other’s too. Fraser Island is also known by it’s traditional name K’gari which means ‘paradise’ in the dialect of the traditional owners. A fitting name for such a beautiful place. If you’ve spent much time on this site you already know that we are active independent travellers, we rarely take organised tours simply because they rarely fit our travel style or the travel preferences of many of our readers. When we do join a tour there’s a good reason. 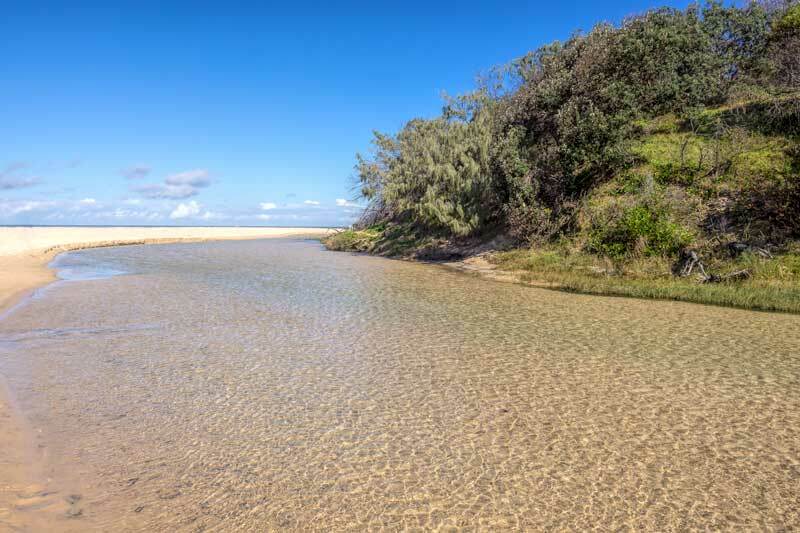 In this case, as we’ve mentioned Fraser Island is a sand island, that means all of the roads, and by roads I mean the beach and some inland tracks, are sand, often soft sand with some steep angles, and deep ruts after a bit of rain on the interior portion. While you can bring a private vehicle to drive on the island it must be a 4-wheel drive and you’re going to want to be experienced driving it, as beautiful as the island is this isn’t the ideal place to learn. Currently we don’t have a 4-wheel drive vehicle or any experience with driving in these conditions which can change daily. If we needed any further convincing that we weren’t ready to attempt a solo drive adventure, on our first trip over some years back we saw a fairly new 4-wheel drive vehicle being consumed by the incoming tide having hit a soft pocket of sand and tipping over. Unfortunately that’s a fairly frequent occurrence and even experienced sand drivers have been caught out on this notorious section of beach informally referred to as ‘the carwash’. As for our choice of tour we wanted something that allowed an active immersive experience similar to what we would plan ourselves allowing us time to swim, hike and climb the dunes. Simply stopping for 15 minutes to take photos at each site wasn’t what we were after. 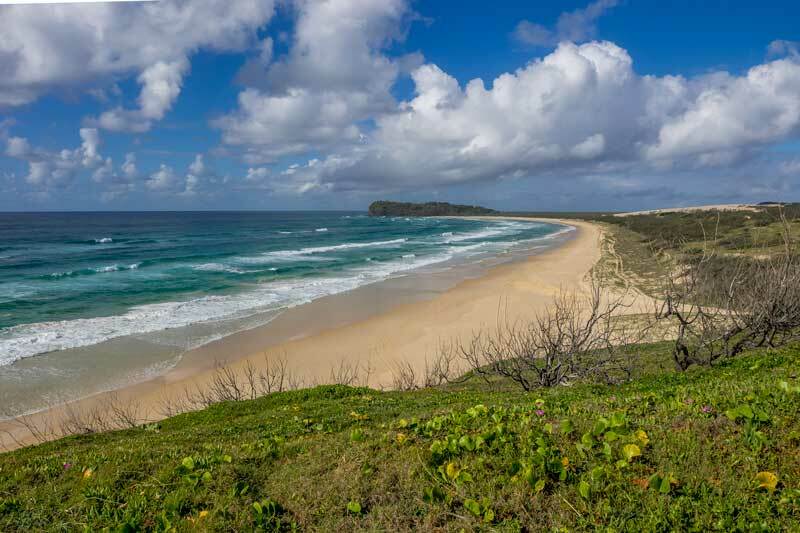 Fraser Island is a decent size at 122 km long and 1,840 km2, too big to viably explore on foot and driving on the beach and sand tracks is of course much slower than normal roads. The 2-day Fraser Explorer Tour is suited to a wide range of age groups, we had a good diversity of age and nationalities on our tour and talking among ourselves at the end it was unanimous how much everyone had enjoyed the experience. You do need to be average fitness and willing to get out and walk, the vehicle can’t and won’t deposit you directly at the destination. I’ll give some examples below when I run through the various sites we visited but walks range up to 4.6 km and you need to be comfortable walking in soft sand and on hills. Vehicular ferries cross to Fraser Island from Rainbow Beach at the top of the Sunshine Coast which takes about 10 minutes and from Hervey Bay which takes about 40 minutes. The ferries also cater to walk on passengers and provide both indoor and outdoor seating plus a stowage area to place luggage or bags you don’t need with you. The tour price includes your ferry crossing from either location and the two groups meet up at Eurong Beach resort for lunch on the first day and then stay together until they depart for their respective ferries. The Hervey Bay crossing is from River Heads at the mouth of the Mary River and we were lucky to get an early wildlife experience here watching a small pod of rare Australian humpback dolphins catch fish on the tide. There’s also the opportunity to spot dolphins and whales from the boat but in May we were a bit early in the season for the whale migration although a couple were already being sighted in the area. The company has a store front location just up the road where you check in for the various stays and tours, there’s secure parking here for a reasonable fee and they run you down to the ferry with your luggage by bus. The tour itinerary will change up as required but these are the destinations we visited on our 2-day stay. Our first stop of the morning was at Lake McKenzie, a stunning fresh water lake. We had around 75 minutes here which is enough to take a few photos, walk the sandy portion of the shoreline, have a swim and relax in the sun on the white silica sand. Lake McKenzie is filled with rainwater, it has no streams flowing in and doesn’t flow out to the sea. Beneath it the sand and leaf matter have compacted over around 20,000 years to form a substance known as coffee rock that prevents the water seeping through. On top of that deep layers of sand have formed that act as a filter making the water perfectly clear and accounting for the gorgeous blue and green colors that the water appears in the different lights. The indigenous name for Lake McKenzie is Lake Boorangoora and I suspect in time we’ll see a move back to the traditional names as we have in New Zealand and some other parts of Australia such as Uluru. Our next stop in the middle of the island was Central Station, a rain forest area that was once a timber camp but with the exception of a few historic buildings that have been retained in the camping area it’s now fully regenerated. The rain forest growing completely on sand is one of the unique ecosystems of Fraser Ialand. 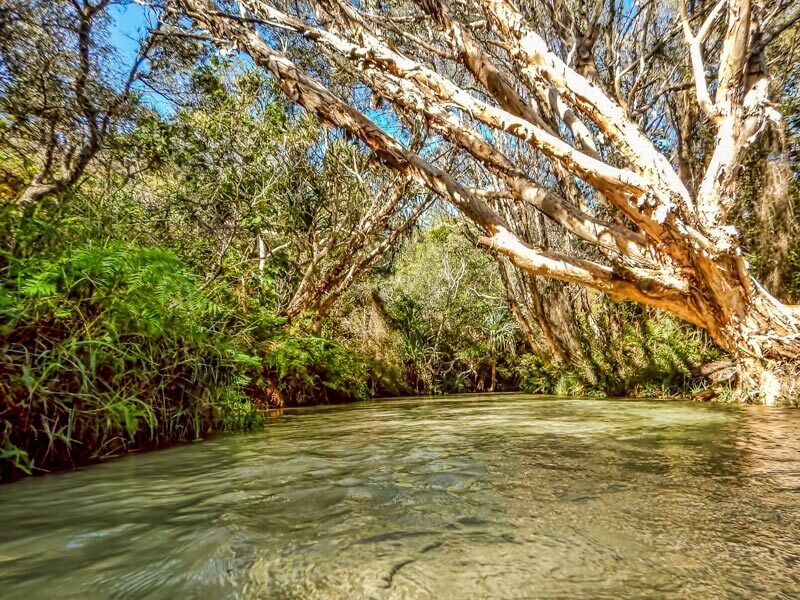 The crystal clear Wanggoolba Creek runs through the area and you can follow it along a 1.8 km one way track. One of the advantages of a tour is that they pick you up at the other end rather than doing the return walk. While we had dry weather while we were on the island it had rained in the previous week and the Australian bush always smells so fresh after some rain. There’s a good selection of rain forest trees, palms, fungi and moss growing along the track and it’s a good length to get an appreciation of the diversity all growing in the sand. There’s also plenty of birds throughout this section, Fraser Island is popular with birders and nature enthusiasts for good reason. Wanggoolba Creek is a sacred site to the Butchulla people, the traditional owners of the land and was a women’s site and birthing area for indigenous women. It’s incredibly peaceful walking along here, it’s gently undulating most of the way with a climb back out of the valley up around 120 steps cut into the hillside towards the end. We then crossed to the eastern side of the island and had our buffet lunch at Eurong Beach Resort before taking our first drive out along 75 mile beach to the walkway entrance for Hammerstone sand blow and Lake Wabby. The walk is a 4.6 km return track initially uphill through soft sand and becoming more packed and easier walking as you progress. The trail opens up on Hammerstone Sand blow with views out to the east coast to the right. There are over 30 sand blows on the island with their number and structure changing over times, sometimes quite rapidly. They appear like a mini desert and this one certainly has it’s own oasis in Lake Wabby. After the walk up to the sandblow from the beach you follow the markers to the left across the plains of sand to the lake. In the late afternoon light the colour was quite striking. 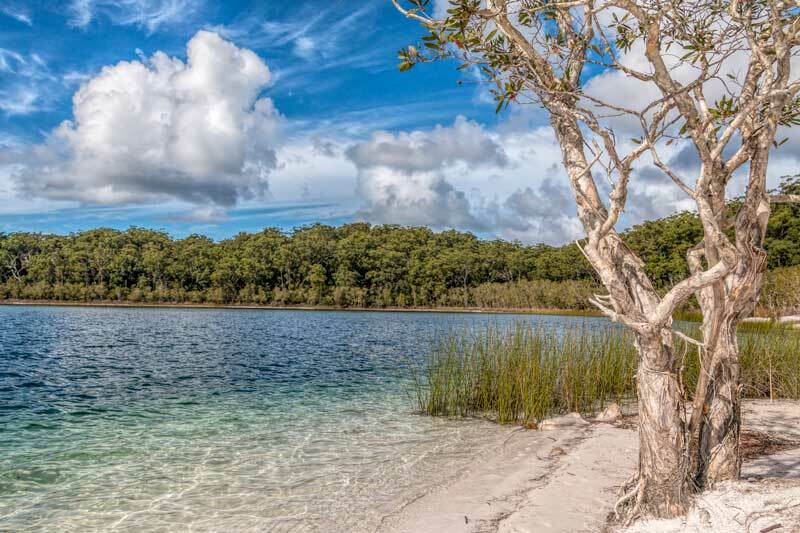 There are around 40 freshwater lakes on Fraser Island but Lake Wabby is the deepest of them and has the lowest acidity level allowing a variety of fish to live in there including some good size catfish. while they won’t attack you don’t try to grab them, they can give a nasty bite. 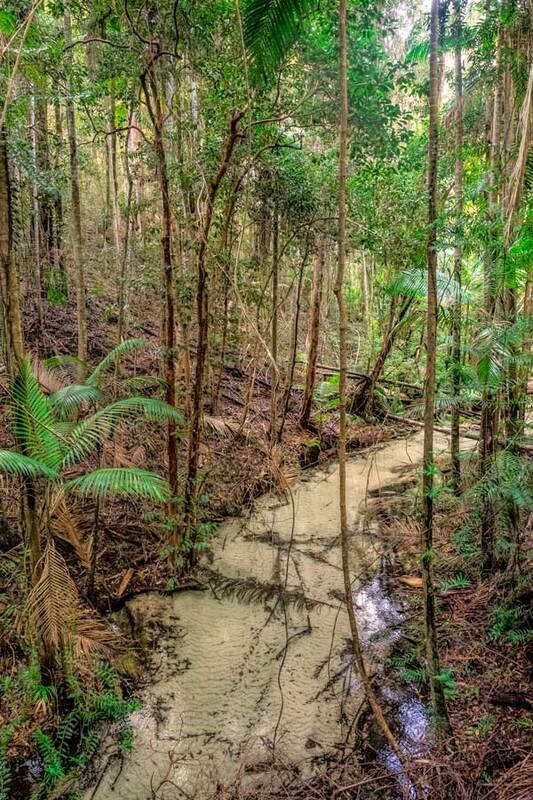 As a barrage lake, also known as a billabong in Australia, Wabby was formed when shifting sand dammed an existing creek allowing the water to build up. With the constantly naturally evolving landscape it’s predicted to be gone completely within 100 years as the sands continue to move slowly filling it in. When we talk to people about Fraser Island most will ask about the dingos, either they want to see one, or they are fearful of them. I feel I should mention them here briefly but I’ll also refer you to the excellent resource put out by the Department of Environment and Science. Dingos, or Canis lupus dingo, are a distinct breed in the dog family, similar to a wolf or jackal. They are a wild animal, native to Australia and protected. 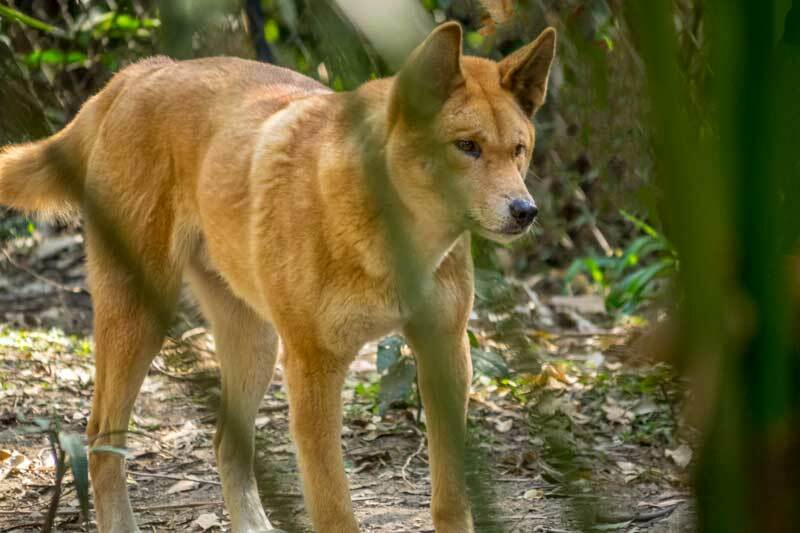 Fraser Island is a National Park and has a healthy dingo population, the relative isolation of the island has also meant that it’s population has stayed predominantly pure-bred whereas in other parts of the country there has been interbreeding with domestic dog breeds. They are an attractive animal, a sandy ginger colour and lean fit build. Like any wildlife I consider it a privilege to observe one in its natural habitat which includes the lakes areas, beaches and sand dunes of Fraser Island. Like much of Australia’s wildlife it can be dangerous if you are unprepared so when on its territory there are some precautions to consider. Keep children close, try to stay together when outside the resorts and campgrounds and stay alert, startling a resting dingo in the sand dunes is going to put it on the defensive. In the unlikely event you are approached by a dingo stand up, form together in a group facing the dingo and call for help. Don’t run or flail your arms around trying to scare it off. To give context there are around 200 wild dingo on Fraser island spread across its 1840 km2 so they are around but aren’t prolific. In 2 days covering an extensive tour of the island we sighted 2, both were on 75 mile beach and neither close enough for a good photo, hence the one I have included here for identification purposes isn’t actually taken on Fraser. The crystal clear water of Eli Creek is shallow but perfect to wade or float through on inner tubes which our guide produced from the bus storage compartment. Eli means crab in the language of the local Butchulla people. The mouth of the creek where it meets the sea moves sidewards, like a crab, up and down the beach by several kilometres over time. Like most of the island development has been limited other than where necessary to protect the environment. 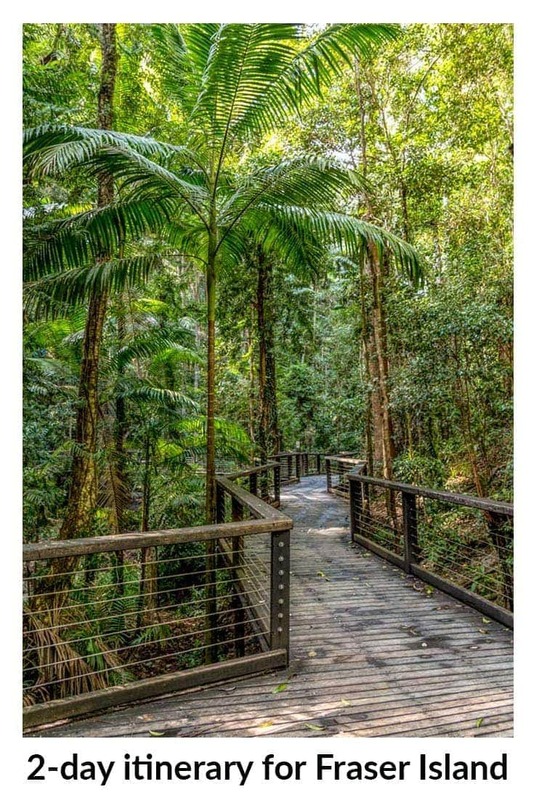 At Eli creek there are toilets and changing facilities, an information board and a boardwalk to protect the vegetation at the side of the stream. Aside from being a stunning stretch of sand and surf, 75-mile beach is also a gazetted highway and an airstrip, one of only 2 places in the world where you can take off and land on the beach. You can drive on most of it but depending on the tides and a few headlands you do need to detour inland slightly at times. Speeds up to 80 km/hr are allowed on the beach but if you’re driving you do need to stay aware of people and dingos wandering on the beach. There’s no tyre sound on the sand and any sound of engines is well overpowered by the crashing surf so fishermen and others walking on the beach can’t hear you approach. 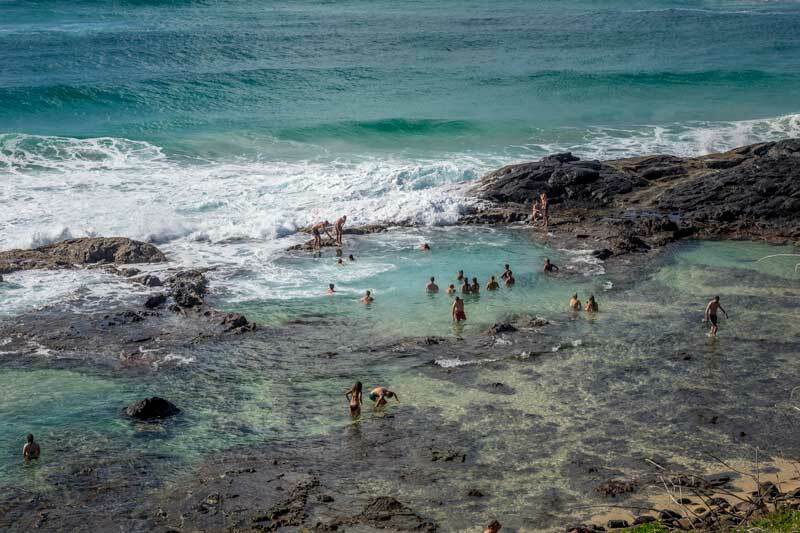 These stunning turquoise rock pools and the views from the boardwalk as you make your way down the cliff from above are perhaps one of the most striking spots on the island. 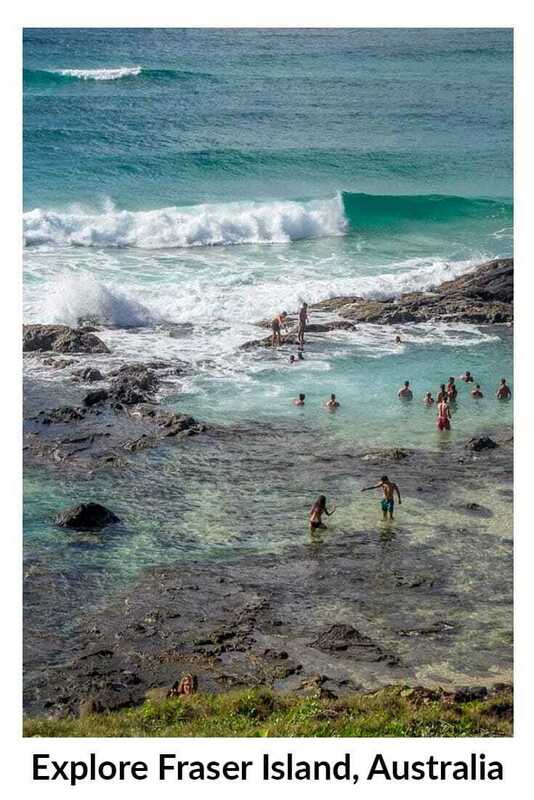 They are understandably popular and offer a safe spot to soak or swim even as the surf breaks with a roar on the natural rock wall surrounding it. We stopped for around 90 minutes for our coffee and morning cookie break here. The facilities include toilets and changing rooms up the top near the car park. 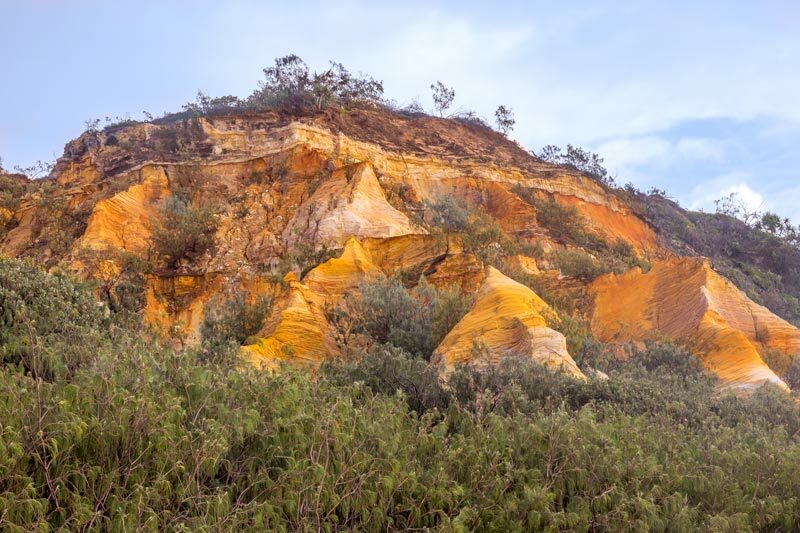 The sand cliffs along this stretch of 75-mile beach north of Eli Creek are colored in many hues from red to golden due to the staining of iron rich minerals. Where the wind and rain erode the cliffs over the years formations such as the pinnacles are exposed and the coloring of the older core is even more brightly colored. You’ll see these cliffs mostly in the areas of the Pinnacles, Red Canyon, Rainbow Gorge and the Cathedrals. They can be viewed right from the beach or a small walkway in towards them. 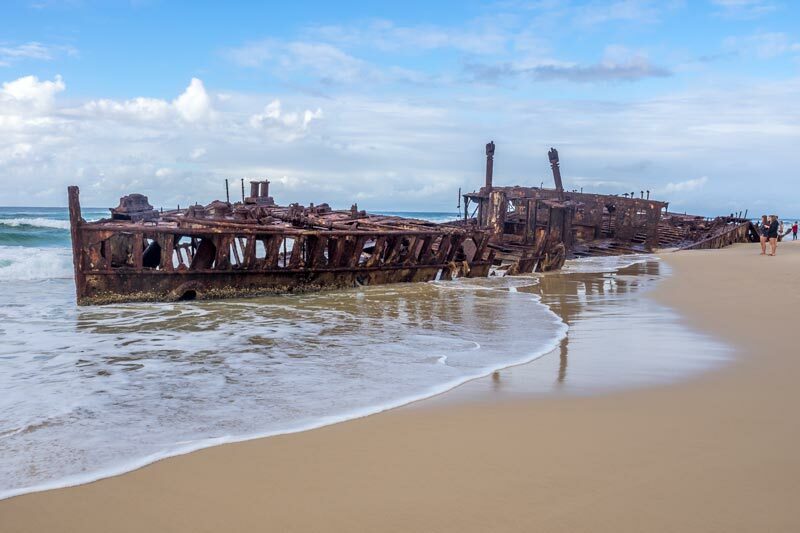 Another site along 75-mile beach is the wreck of the Maheno. This New Zealand ship has had quite a history since it was built in 1905 and was used to carry commercial passengers between Australia and New Zealand. During the Great War she was refitted as a hospital ship and help repatriate the wounded from Gallipoli and across the English Channel from the Western Front before being returned to her commercial owners. Eventually in 1935 she was retired and sold to the Japanese as scrap metal but while towing her back to Japan with an under powered tow-ship she was caught in a cyclone and wrecked on the beach at Fraser Island. When efforts to re-float her failed she was stripped of fittings but the frame left to the elements. The lookout at Indian Head gives some great views of the coastline and from directly above the water there’s the opportunity for marine life sightings too. Pods of dolphins and sea turtles are seen frequently and spouting whales further out. It’s suggested you take the slightly longer walk up from the side rather than the goat track in the front to prevent unnecessary erosion that daily visitors can inevitably cause. 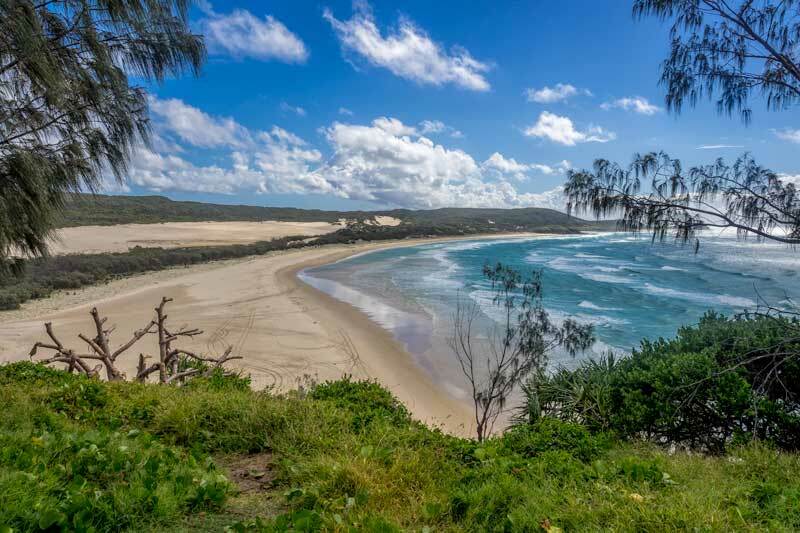 On your trip across to Fraser Island and from lookout points such as Indian Head you’ll want to be on the lookout for whale spouts during the ‘winter’ months from June until October. 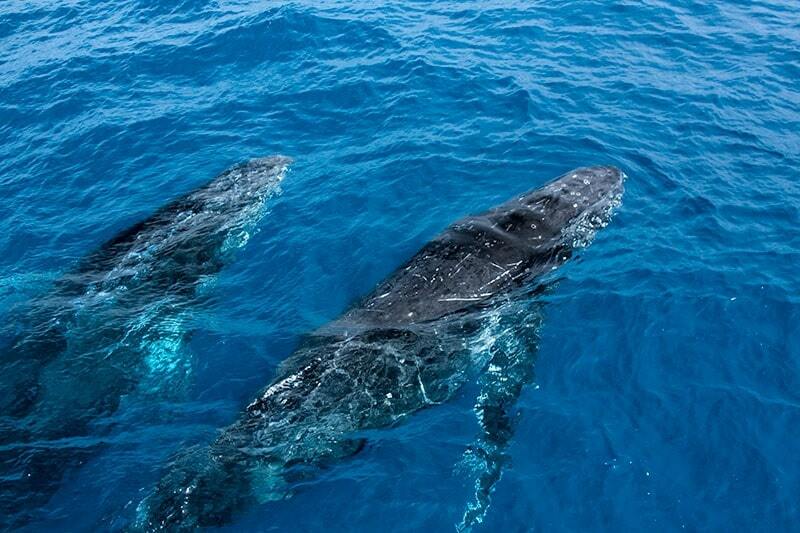 Whales are an important part of the marine environment here and daily whale watching trips can also be organised from Hervey Bay that come out around the island giving the chance to see them up close. We’ve been whale watching in many different places but Hervey Bay remains our favourite and one we take the chance to do whenever we can. The Fraser Explorer Tour accommodation is at Eurong Beach Resort on the southeast of the island. The motel style units have a large deck furnished with a couch, table and chairs to sit outside. Inside is comfortable sofa seating with a TV, kitchen facility, bedrooms and bathroom. 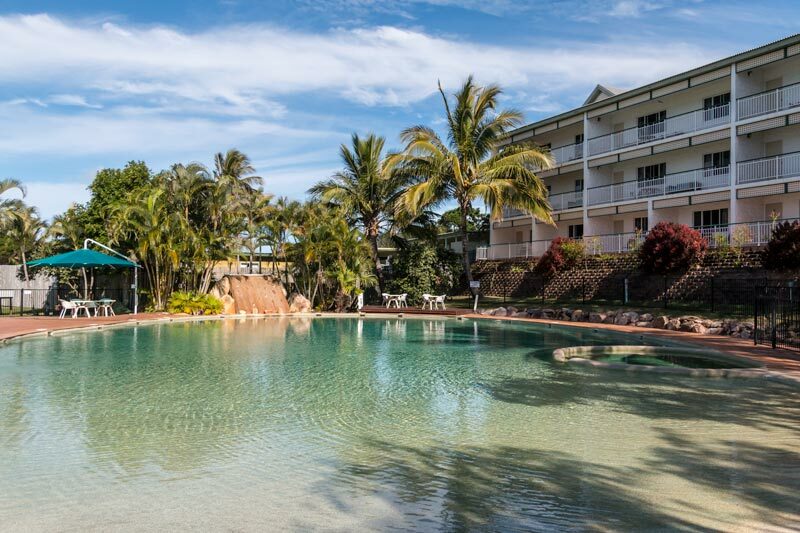 The resort targets budget and family style accommodation, the structure is older but the rooms have been renovated with modern furniture, fittings and air conditioning. The apartments themselves are comfortable, spacious and clean. 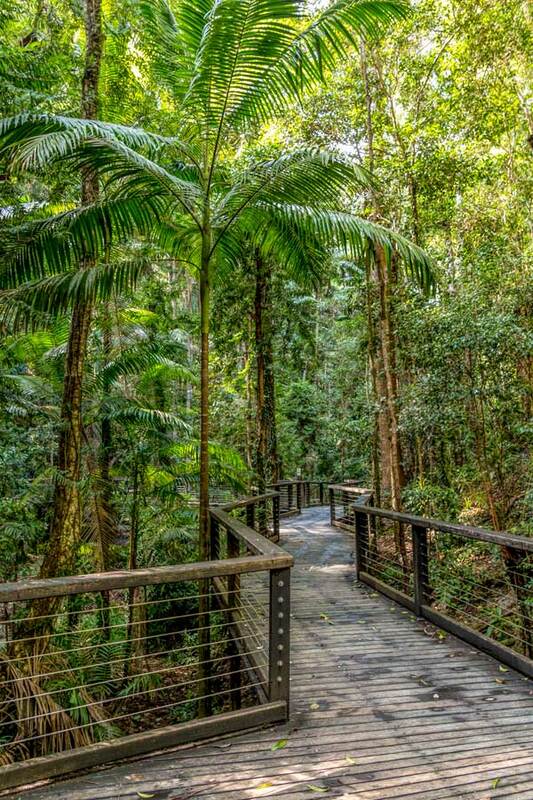 If you are travelling independently on Fraser Island there are also camping options and the Kingfisher Bay eco resort on the western side of the island. We were just as blown away by the natural beauty and unique landscape of Fraser Island on this second visit as we were over a decade earlier. While there were a few additional facilities (bathrooms and boardwalks) these had been added sparingly and in a way that protected the delicate ecosystem from the increased popularity of the destination. Fraser Explorer Tours who we were partnered with for the trip had a well planned itinerary that enabled us to spend time in and really experience each stop in a way that was quite similar to what we would do if travelling independently. A young marine biology student who was on our tour said she had decided to do the trip at the last minute after Fraser Island was so highly recommended by so many people in the industry up in Tropical North Queensland. I think the high praise is well deserved and I’d recommend a trip out here to anyone who wants to see the truly special natural beauty of the area and experience a well preserved but accessible part of Australia’s wilderness. Interested in Fraser Island? Please save these to Pinterest. I am a huge lover of the open air and because I live in Greece, I am no stranger to the beaches either. This place looks absolutely magnificent though. I have only been to Australia once, and it was many years ago, but was not able to locate a place like Fraser Island that you talk about here. It looks completely tranquil and waters and scenery look so inviting. I was lucky enough to take a tour around NZ some years ago too, and although there are some nice places, I did not see anything close to this. Thanks for sharing, I really enjoyed your website. Thanks for getting back to me, and yes you are really lucky. So cool that is is the world’s largest sand island Toni. Brilliant waters too. Any time I can get away from it all to enjoy a tropical paradise I seize that opportunity. Nothing like a beach with pristine waters and a calm vibe. Adding in wildlife makes it more special. Especially dingoes. Rocking post!